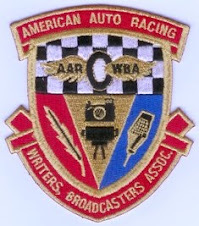 If one were just talking about the level of professionalism and talent found throughout the paddocks and race track of the teams that had come to compete in the 4th MAVTv 500 at the record holding superspeedway, Auto Club Speedway, we would be saying "Embarrassment Of Riches." But we cannot ignore the embarrassment bestowed upon the riches that were on display for a record-setting 500 miles for 250 laps that recorded 80 lead changes, four and five wide lane competition for the lead where a driver was able to breakthrough a seven year, 124-race winless drought to take the trophy for a Honda-powered and aerodynamically-wrapped Dallara, Rahal Letterman Lanigan Racing's Graham Rahal. The embarrassment was that this monumental display of automobile racing talent put on by the teams and drivers of the Verizon IndyCar Series was only physically witnessed by (depending on who one listens to) 3,000 / 5,000 / well under 10,000 people who had come out to watch the race in the Fontana, California afternoon sun at Auto Club Speedway (ACS). A racing facility as large as ACS routinely hosts and supports crowds as large as 70,000 to 80,000 for its annual NASCAR stock car race in Southern California, where the market has 15 million people, is no problem. This shortfall in attendance can most legitimately be placed on the racing series management. The first point-of-order to consider is the movement of the date and the change in the importance of the scheduling of the race at Auto Club Speedway, itself. Over the previous three years, IndyCar had chopped the schedule to end before the beginning of Professional Football season for it was perceived by management that this kind of direct competition for entertainment dollars was not good for gate and television receipts. The season had to end by late August or early September to accommodate this view. 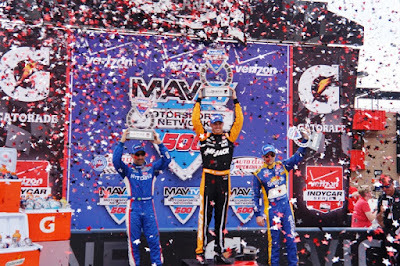 As to the change of importance of the MAVTv 500, during the previous three years this race was the last race of the season, and in each case, since the points race was so tight, the race decided who would be crowned the champion of the season. Lastly, the MAVTv 500 was a race ... again, for three years ... that started in the late afternoon sun and transitioned into the evening giving the race on a high-speed oval some additional mystery due to changes in the light, temperature, and strategy employed by the teams in order to finish on top. 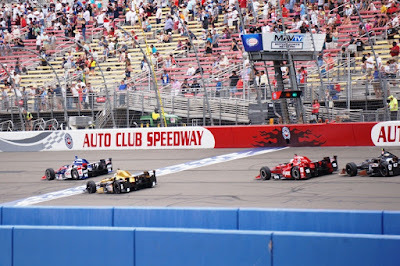 In 2015, it was decided that the MAVTv 500 was to be moved to an all-afternoon race at the end of June when the summertime heat was beginning to get its legs in the desert climate Los Angeles is known for. Normally, temperatures are in the mid-eighties but the weather pattern became humid and hotter just before the race was to be run where two days before practice took place on Friday, June 26, 2015, the temperature broke through the 100 degree mark. On raceday, however, the track was blessed with a little monsoonal cloud cover reducing the near 100 degree predicted temperature to be only about 90 degrees. The MAVTv 500 was just race number 11 in a shortened 16 race season for points and the championship. The way the season was planned by management was 17 races for points to decide the championship, but just before the season was to start, the race to begin the season in Sao Paulo, Brazil was cancelled. No make up race for points was ever scheduled. The MAVTv 500's previous significance as Season Finale, with the pomp and circumstance of evolving day-part change -- to "just another" oval race to begin a stretch of oval races at The Milwaukee Mile on July 12 - Iowa Speedway on July 18 - & Pocono's Tri-Oval on August 23 over the summer months was just too big a change for the public to handle. Further, with very little promotion to bring awareness to these changes in the months leading up to the race date by IndyCar management, there was very little that the racing venue could do to unbake this cake ... and evidence suggests that everyone at Auto Club Speedway did their best against these scheduling change odds placed upon them by IndyCar. The riches were enjoyed by those who were there or watched on television. On the web, most all of the comments were in support of the MAVTv 500 being one of the most entertaining races held in years where full crowd attention appeared to be focused on the track for all of the 250 laps of competition. Cheers could even be heard throughout Auto Club Speedway by the (depending on who one listens to) 3,000 / 5,000 / well under 10,000 people at the track when a RED Flag was displayed in order to preserve the final four laps to competition as opposed to having the race cars circle the track to end the race under a YELLOW Flag. 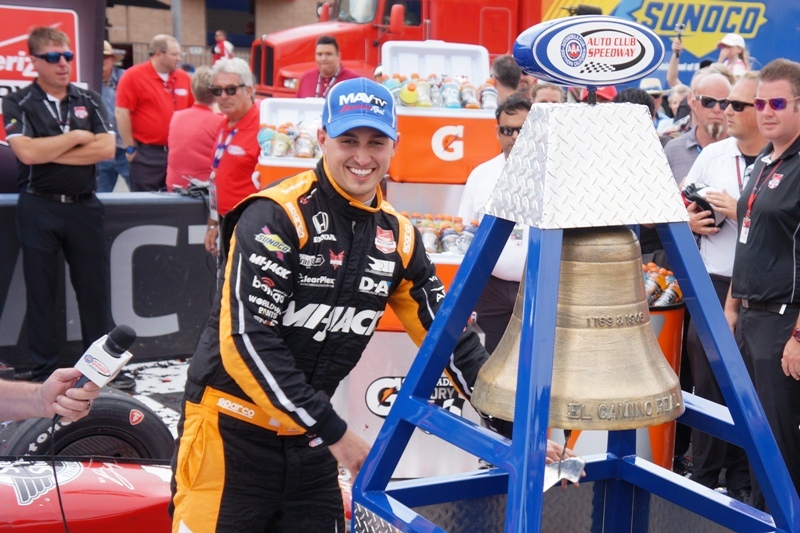 This could be pointed to as the best decision Race Control and series management made in support of the MAVTv 500 ... save a non-penalty call for the race winner Graham Rahal. The No. 15 entry driven by Rahal Letterman Lanigan Racing's Graham Rahal will face a post-race review for potential penalty because of a Lap 187 pit stop in which the gravity-fed fuel coupling broke off still attached to the car as Rahal sped away. It dislodged, forcing a caution for debris. ** It is perfectly ok to plan a series for 17 races that ends before there can be the threat of any competition for the entertainment dollar by Pro Football. ** Loses a race to cancellation at the beginning of the season, and is just fine to not schedule a make-up points race. If Series management isn't serious against the plan how does one expect the fan to be serious? ** Race-Control-By-Committee without having one race car driver with real racing competition under his/her belt on the committee - let alone that experience tells us that too many cooks spoil the broth. ** With a country that has a population of over 300 million people, bringing back, and adding, Brian Barnhart to the Race-Control-By-Committee. ** Increased use of post-competition penalty assessment when many infractions cited in this way were clearly visible as on-track infractions. ** Lack of clear understanding of the discretionary usage of YELLOW, RED, and BLACK Flag track condition employment. ** Series Management through the reliance on information from outside consultants - do they also have as clients ... Pro Football? 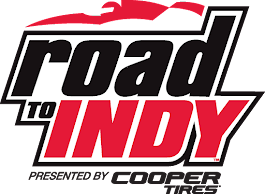 ** Guts the importance of "Bump-Day" at Indianapolis 500 on the premise the only thing that matters is the Month of May in Indianapolis - because outside of two races, the rest of the season is window dressing and ultimately does not really matter against plan. After all, "our country club is the only country club." ... add your own perceived professional racing series embarrassment here. ** That adheres to a full race season points schedule (and 20 races would be nice). ** Where the season championship points race is of prime importance over the course of seven to eight months. ** The absolute fear of competition of other sports, especially Pro Football, be damned. ** Automobile craft and innovation is fostered. ** The development and recruitment of talent is paramount. ... add your own perceived culture improvement here. Robin Miller, of Racer Magazine and the NBCSN broadcast team, had been somewhat quiet until race end at the MAVTv 500 where he placed out a challenge to all of the team owners to wrest control of the management, and thereby the culture, of professional open-wheel racing from Mark Miles and the country club crowd that calls Indianapolis their home. The riches shown by the drivers and teams this season has been something to behold. The last 20 laps of racing at the INDY 500 were probably some of the most exciting and professional on display - ever ... as could be said for the MAVTv 500. 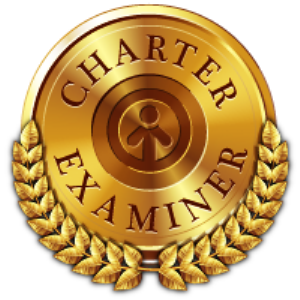 Those who have the greatest investment in the outcomes need to begin the process of inculcating a culture of determination and competency as opposed to a culture of control, dictate, and fear of entertainment competition. We need to honor the talent and efforts of these drivers and teams. • Auto Club Speedway: “Auto Club Speedway is one of the most exciting high speed ovals. It’s a very fast track and there are lots of overtaking opportunities. I always enjoy racing there and I have great support too [from the fans]. 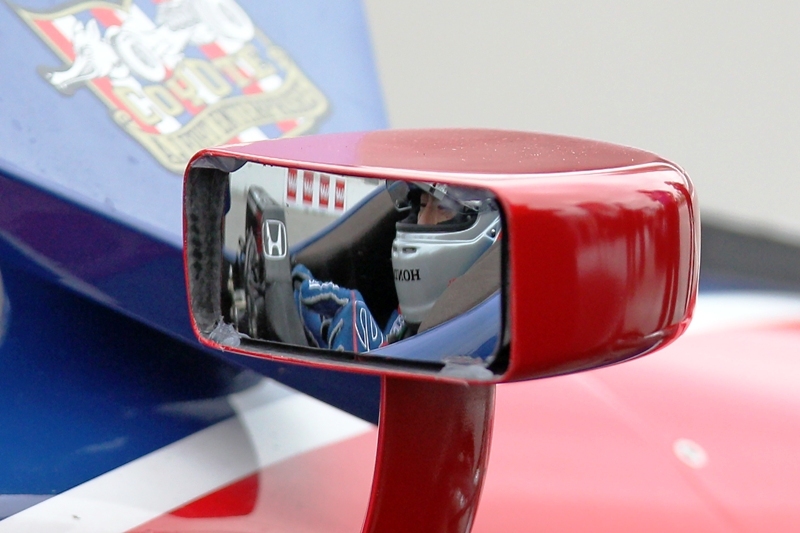 Takuma Sato has become one of the most recognizable and respected names in motorsports. At 10-years-old, a family friend took the young Takuma and his father to the first Formula 1 race in Suzuka, Japan in 1987. Takuma never forgot the excitement of that first race. He began his competitive career racing bicycles and did not turn his attention to driving machines until the age of 20 ... late by most standards in motorsports. After a competitive season in All-Japan Formula3, Sato kept his sights on racing in Formula 1 which he was able to do full-time beginning 2002 to 2008. 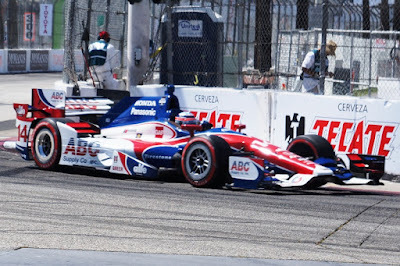 After a short hiatus, Takuma Sato was able to transition to the IndyCar Series in 2010. The last three seasons, he has been driving for A.J. Foyt Racing with a major highlight being winning the Toyota Grand Prix of Long Beach. This year, Takuma Sato's results have been star-crossed at best, while starting the season's first race qualifying well, mechanical and incident issues have rotated his car to the lower half of the running order at race's end. He currently sits just outside the top 10 at P13 in the season championship points race. 2015 highlights include, setting the fastest lap average speed recorded by a Honda-powered car at INDY 500, registering a P2 podium finish in the second race at the Duel in Detroit, and is P4 of 21 drivers to drive Honda-Powered cars this year. Takuma Sato and A.J. Foyt's ABC Supply team both posted their best start of fourth ... and best finish of sixth at Auto Club Speedway's MAVTv500 last year. 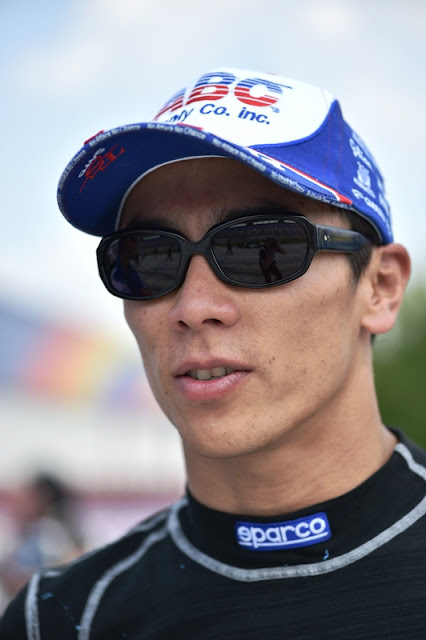 Perhaps the greatest factor in Sato’s success is not his quickness behind the wheel as much as it is his optimism or his perseverance in the face of adversity. Those are qualities he shares with his team owner A.J. Foyt whose career is distinguished as much by the comebacks as it is by the victories. First, welcome back from a weekend off after a run of 9 to 10 straight weeks of racing, and testing. I understand you were able to go back to Japan to visit family and do promotional and awareness appearances. Please give us an idea of some of the more interesting appearance activity that impressed, or entertained you most. It is no secret, after 10 races, that with the use of the new aerodynamic body parts to the Dallara DW12, Honda was found to be generally underpowered for long straight-aways on road/street courses and somewhat unstable when encountering trailing turbulence. Scott Dixon, who drives a Chevy-powered and aerodynamics DW12, stated after the INDY 500, that if he found himself more than a couple of cars from the front, the combined trailing turbulence was too much to overcome to drive back to the front. What has been your primary experience of change over the last year's version of the DW12 - First - On Road/Street courses vs Oval courses? Second - Major factors of Power vs Trailing Turbulence? IndyCar has scheduled two one-hour practices with the last one ending at 1:30pm PT on Friday ... before a late afternoon qualifications session beginning at 4:15pm PT. With the race due to be run in a predicted 95 degree plus heat on Saturday June 27th, is there enough afternoon, hourly conditions drive time, to effectively set the car up for a race, which is set to be run from 1:30pm to 4:45pm PT in the afternoon? When you have been able to gain positions on the track during a race, on Road/Street courses, you averaged a gain of 6.75 positions whereas, on Oval courses, you averaged a gain of 11 positions. Would you say that you are more of an Oval course specialist or a Road/Street course specialist in light of this view of the year's results? We are facing an end of season, at this point, before the MAVTv500, with six races to be run ... [note: this was cut-out due to time - and four of the races are on tracks that are classified as Oval courses - the superspeedway at Auto Club Speedway, the flat track "bullring" of The Milwaukee Mile, the classic oval at Iowa Speedway, and the tri-oval superspeedway of Pocono Raceway]. Please give us a flavor on how your driving and team strengths match up to each of the challenges ... First, next weekend's Auto Club Speedway, The Milwaukee Mile on July 12 - Iowa Speedway on July 18 - & Pocono's Tri-Oval on August 23. Any final thoughts on this weekend’s 500 mile / 200 lap MAVTv500 from Auto Club Speedway? Well, Takuma Sato, thank you for sitting down with us and we wish you consistency and great success through the rest of the season. After enjoying their first weekend off since early April, CFH Racing drivers Josef Newgarden and Ed Carpenter, along with their mechanics and engineers, are rested and ready for Saturday's 500-mile race at Auto Club Speedway in Fontana, Calif.
CFH Racing is coming off the highest of highs after a spectacular 1-2 finish at the last race in the streets of Toronto. Newgarden, driver of the No. 67 Hartman Oil Chevrolet, claimed the victory 1.4 seconds ahead of teammate Luca Filippi in the No. 20 Fuzzy's Vodka Car. A strategy call to pit early to switch from rain tires to slicks vaulted Newgarden to the front of the field, where he battled the rest of the race. Meanwhile, Filippi raced forward from his career-best starting position of 6th and was Newgarden's biggest challenger at the end of the event. Auto Club Speedway has been the backdrop of much success for CFH Racing, with team co-owner Carpenter finishing on the podium each of the last three years. Newgarden earned one of his best starting positions last year at the 2-mile oval, starting on the front row after qualifying third. In the previous three events at Auto Club Speedway, Carpenter has led 65 laps. Newgarden led his first career Verizon IndyCar Series lap at the track during his rookie year in 2012. 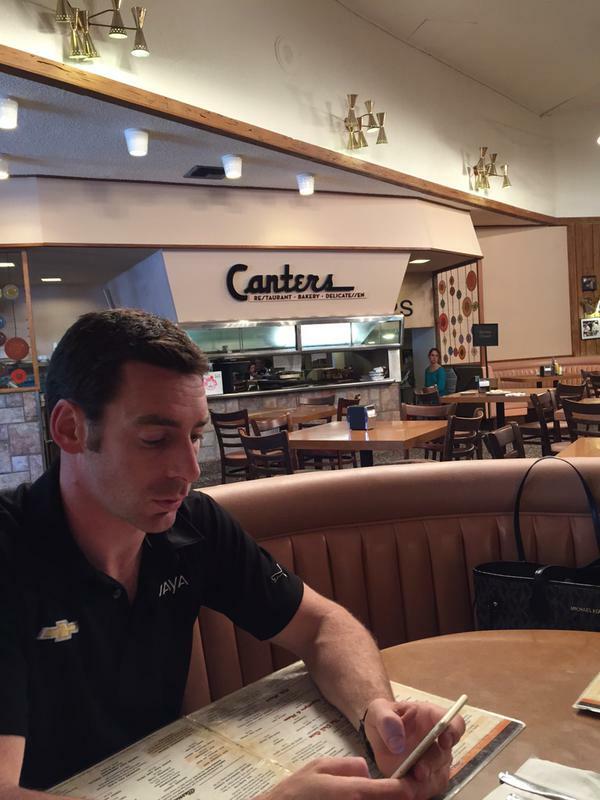 Carpenter has six previous starts on the oval track located outside of Los Angeles; Newgarden has three. The 24-year-old Newgarden is having a career-best season since joining the Verizon IndyCar Series four years ago, capturing two wins in the past seven races. His victory at Barber Motorsports Park in late April was the first of his IndyCar career. The Hendersonville, Tenn.-native has finished in the Top 10 of half of the events this year. With his win two weeks ago in Toronto, Newgarden joined Juan Pablo Montoya and Scott Dixon as two-time winners through 10 races this season. CFH Racing is now ranked with Team Penske and Chip Ganassi Racing as the only teams with multiple victories in so far in 2015. The 2015 MAVTV 500 will feature 250 laps and is one of three 500-mile events on this year's schedule. The race be broadcast live on NBC Sports Network at 4 p.m. ET on Saturday, June 27. ED CARPENTER, NO. 20 FUZZY'S VODKA CHEVROLET: "It is always exciting to go back to Auto Club Speedway in Fontana. It has been a track that we have had a great history at the past three years with a podium each year. We have really been struggling on the ovals so far this year, but I feel like Fontana is a great track to get things turned around. We have been working very hard to make sure we go there with a good plan to address some of the struggles that we have had. I can't wait to get on track and get back up to speed." JOSEF NEWGARDEN, NO. 67 HARTMAN OIL CHEVROLET: "I am really excited to get to Auto Club Speedway. We've had a lot of work to do since Texas and have put a lot of effort in at the shop to be as prepared as we can going into Fontana. Hopefully we can keep the good results rolling after Toronto! I have a lot of faith in all of our guys. We have a lot of good, smart people on the team and I am looking forward to a solid weekend in California." Ed Carpenter is a two-time Indianapolis 500 pole position holder, this earned, on his home track. Known to be an oval-track driving specialist, who has three IndyCar career wins, all on ovals, he won his second race at the inaugural MAVTv500 at Auto Club Speedway in 2012. 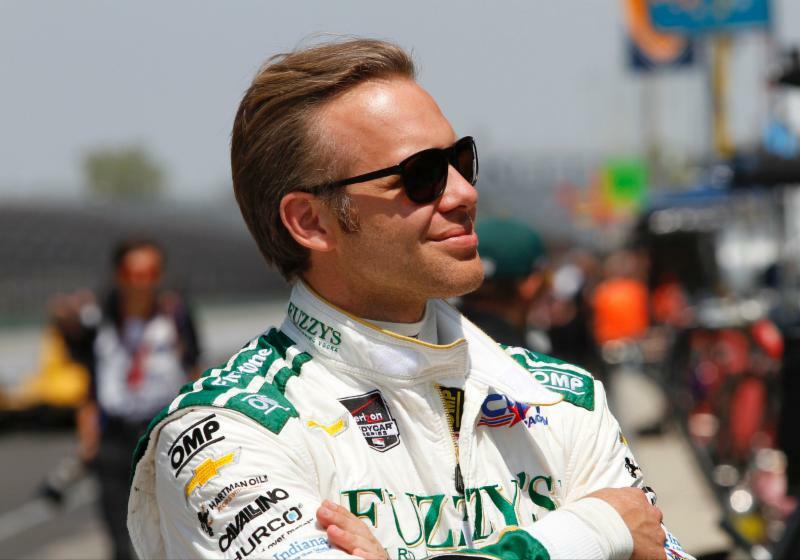 He accomplished this win as a first-time team owner, and driver, of Ed Carpenter Racing. In 2014, as team owner, Ed hired Mike Conway to drive the #20 Fuzzy's Vodka Dallara DW12 in all street/road course races. This bold move allowed the team to garner three wins for the season and gather enough single car combined points, if allowed to be shown against single driver/single car standings, to break into the top 10 at P8 – good for sponsorships. This season, Ed Carpenter is co-owner of CFH Racing team that combined efforts of Ed Carpenter Racing and Sarah Fisher Hartman Racing in the off-season. After 10 races, CFH Racing driver, Josef Newgarden, has two wins, and holds down 8th in the current season’s championship points standings, ahead of recognizable drivers as Tony Kanaan, Simon Pagenaud, and Charlie Kimball. As the only owner/driver in the series, Ed has placed himself to drive all six ovals on the 2015 Verizon IndyCar Series schedule. A huge basketball fan of his alma mater, Butler University, Ed also follows the NBA’s Indiana Pacers and NFL’s Indianapolis Colts. 2015 has been a crazy year, with the cancellation of the first race of the season, the introduction aerodynamic body work to the seasons tested DW12 chassis, then the merger of two teams. What has it meant to you as a owner/driver to share ownership responsibilities with someone who is as big an independent supporter of American Open-Wheel racing as yourself, Sarah Fisher? As a driver, how does it feel to be a part of a team owned, by an owner, that you had driven for in the past, before becoming an owner/driver, and what lessons has this imparted to you along the way? 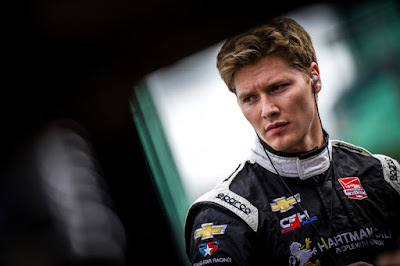 Josef Newgarden, after winning his second race sits at P8 in the driver's championship points race, Josef has done well here in qualifications - in 2014 qualified P3 and finished P10, even though he is a team-mate, what counsel will you be giving him as team owner on how to survive the race and achieve maximum points? The Auto Club Speedway has been an excellent venue to showcase your driving skills - As mentioned, you won the first MAVTv500 in 2012, started 7th and finished 2nd in 2013, and last year, you started in 14th and finished in 3rd ... All of the previous races started in the sunlight of early evening and finished well after sundown and were the season finale. What will change, with a track that will be run, for the first time, in this Verizon IndyCar Series modern era, in the afternoon 90 degree plus sun, 500 miles, 200 laps, and comes with another 5 races to be tackled before seasons end? Further, all of the previous at Auto Club Speedway races were run without the new aerodynamics body work, that has some concerned about the increased levels in trailing turbulence, keeping drivers from being able to charge toward the front - I think this view was shared by Scott Dixon post INDY500 with other drivers chiming in after Texas. Have you experienced this and will you have to change or adjust your driving style at all? As an owner, or a driver, what else do you anticipate for this next Verizon IndyCar Series Saturday afternoon race? 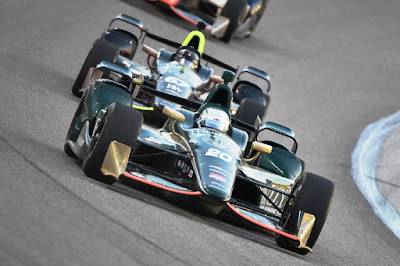 Thank you, Ed Carpenter ... good luck to you, Josef Newgarden, and the rest of the crew at CFH Racing to maintaining the good results at Auto Club Speedway's MAVTv500. MAVTV 500 Returns to Auto Club Speedway - Sat. June 27. 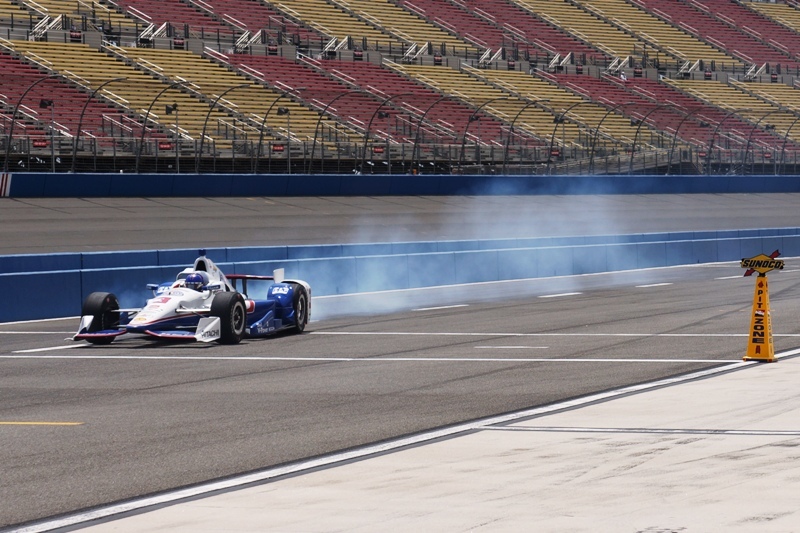 Now into its fourth year commitment, MAVTV Motorsports Network will sponsor the MAVTV 500 Verizon IndyCar Series race at the Auto Club Speedway in Fontana Ca., on Saturday, June 27. 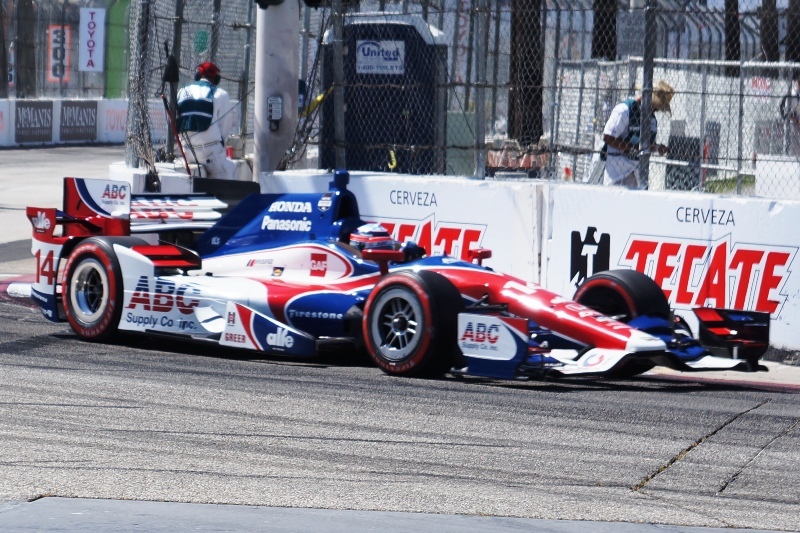 The MAVTV 500 is round 11 of the IndyCar Series championship and the points' battle is heating up with some of the world's fastest drivers in the field including 2015 Indy 500 champion Juan Pablo Montoya and reigning IndyCar series champion Will Power. 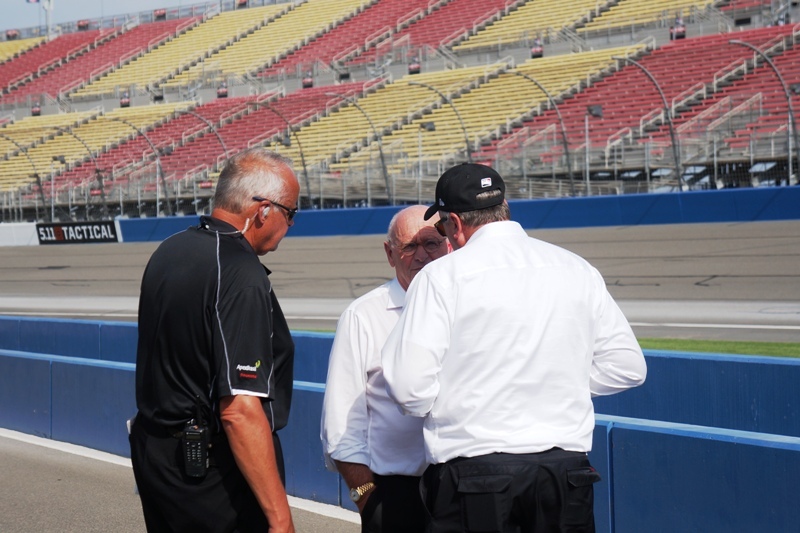 Grand Marshal for the 2015 MAVTV 500 will be motorsports broadcast legend Dave Despain. Programming Note: The Dave Despain Show returns to the MAVTV Network on Sunday, July 12 at 8pm ET. Following the premier, each weekly episode will air 30 minutes later on Sundays at 8:30pm ET. Monster Jam Truck World Champion and off road racing star, Todd LeDuc is Honorary Starter and will drop the MAVTV 500 Green Flag at 1:30pm PT. Russo & Steele lived up to its billing as an auction house that includes European Sports, American Muscle, Hot Rods and Customs with a stable of 475 cars that included outstanding examples in every category. While other auctions houses often focuses one segment of the collector car market Russo & Steele featured the top current trends. This business model works well in Southern California where given the weather you can drive anything with wheels all year long. One such top performer was the 2005 Porsche Carrera GT producing 605 hp from its V-10 and capable of 0-60 mph in a mere 3.5 seconds, considered the pinnacle Porsche at the time. Adding to the performance appeal is its rarity with only 1,270 produced over a four year period and a sticker price of half a million. Collector cars like this modern one also make the case for return on investment since this ten-year-old car sold for $840,000. Another ROI example was the 2006 Ford GT, when new this car sold for about $160,000. I had a client that wanted one when it was introduced and few were available. Friend Beau Boeckmann of Galpin Ford was willing to sell one at just below sticker price when others chose to take ten thousands over list. At the last moment the client backed out thinking that the GT would not hold its value. This owner “brought to hold’ and sold his Ford GT, with198 miles, at sold a top of market price of $337,700. Ask yourself does your stock market portfolio return similar ROI? Did you have any fun with those stock certificates? Did you and your lady take the stock certificates up PCH for a weekend in the wine country? Yes, car prices do go up and down at times with the economy but collector cars do not merge, get overly regulated or go out of business. Sure few people have that kind of money for a car but lets look at what I found to be the best performance value on Saturday. Remember the early 1990’s Corvette ZR-1 with a motor developed by Yamaha putting out 400 hp? When new it cost over $60,000. How about a red one for $15,000 as your weekend get away car? A 1991 ZR-1 coupe sold at no reserve for that plus buyer fees. These cars have bottomed out and will only go up during the time your enjoying it. Certainly, Russo & Steele are salesmen too. However their business is done in a low-key friendly manner, appreciated by the novice as well as the serious collector. This is one the their trademark distinctions. The Newport Beach auction in particular makes a great venue for those just getting interested in collecting cars given the variety and attitude of the staff. In the parking area I ran into a family of five all involved in detailing a 1955 Buick hardtop. They were there to sell their car to provide a college fund and hoped to get $25,000 for the car. For the serious collector there were some rare and unusual cars to bid on including a 1958 Packard Hawk with a McCulloch Supercharger putting out 275 hp. This is the period when Studebaker and Packard merged to survive. They only produced 588 so it’s unlikely you will see another this good. It sold for $95,000. The most unique custom had to be the 1946 Chevy 3100 pickup with an acrylic engine cover to show off its specular motor featuring a triple carb setup. For star power car designer Chip Foose was in attendance. He brought his subtle and tastefully customized 1960 Starliner Coupe; the only missing element was the delightful AJ. Barry McGuire was in house and drawing a crowd wherever he went too. The auction also featured Burt Reynolds 1957 Thunderbird. From the era of tailfins was a show winning 1961 Chrysler 300, with its space age dash and interior. A Shelby GT 350H fastback, one of the Hertz rent-a-racers sold for $137,500, while the 1962 Corvette Restomod brought $102,500 compared to the stock, 1962 Corvette Fuelie convertible registering $130,000. The European Luxury/Sport segment was well represented with a Mercedes Benz 280SE convertible bringing $380,000 and a 1957 Porsche 356T Cabriolet at $181,600. Dino Ferrari 246’s continued to be hot with a 1972 246 GT coupe at $290,000 and 1973 246 GTS at $325,000. Most unique in this field was a 1971 Maserati Ghibli, automatic reaching $226,660. In the European Sport/Racing class was a Jaguar XK-SS recreation in outstanding condition. The XK-SS is the street version of the 24Hours of Le Mans; three time winning Jaguar D-Types of the mid 1950’s. Regrettably only 16 were ever built, the factory burned in 1958 destroying the remainder. About the only place you will ever see a real one is at the Petersen Automotive Museum. This is the same car that Steve McQueen terrorized around Hollywood in. This British Racing Green XK-SS sold at $150,000, real ones sell in the millions. The auction was a outstanding success with sales over $7 million dollars. This represented a 71% increase over 2014 giving every indication of a strong collector car market and proper business model. With only six races left in a shortened, messy, and much complicated sixteen race season, we find ourselves facing a series of oval races leading to a season finale at the famed road track located near the San Francisco bay area - Sonoma Raceway. The 2015 series season began by not beginning as it was scheduled ... through a late cancellation of the first race. The anticipated new aerodynamics body work created and added to the Dallara DW12 chassis by engine providers Chevy and Honda has had many problems including, lack of allowable testing, durability, trailing turbulence, and changes ordered by Race Control. Decision making in race management by Race Control has been inconsistent in its application of penalties, the changing of the consequences of penalties, assessing penalties post race where if assessed during the race may have changed order outcomes, inconsistent Flag Control over the race track by leaving the track under Full Course Yellow when a Red Flag condition would be correct call and vice versa - conditions resulted in potential changes in race end outcomes and championship points. With this as an overlay for the 2015 season, the racing on the track has probably been the most challenging and professional across the board the fans have been treated to in years. The 99th INDY 500 ... especially the last 20 laps were some of the best the old brickyard has ever produced. We are talking with the latest addition of a 4 driver line up at Team Penske super-team for 2015, Simon Pagenaud. The Verizon IndyCar Series finds itself with a weekend off between this last weekend's street course race at Toronto and the superspeedway 500 mile challenge of Auto Club Speedway in Fontana, California ... after an intense nine consecutive weekends of either testing, qualifying or racing. The 31-year-old Frenchman drives the #22 Penske Truck Leasing Chevrolet/Dallara for Team Penske, along side, Helio Castroneves, Will Power, and Juan Pablo Montoya. Now in his fourth full season in the Verizon IndyCar Series, Simon has four wins, including the inaugural Grand Prix of Indianapolis in 2014. In qualifications, Simon has been in the Firestone Fast Six phase of Knockout Qualifying of every street/road course session since the beginning of the season which has had Simon secure three top-five finishes in those six races this season, and after last weekend's Honda Indy Toronto, moved up one position to 10th in the point standings. He earned the 2012 IndyCar Sunoco Rookie of the Year and is a 2010 American LeMans Series Champion. Known to drive anything, Simon competed in the Pikes Peak Hill Climb in 2013 driving a modified Honda Odyssey minivan and finishing second in class. 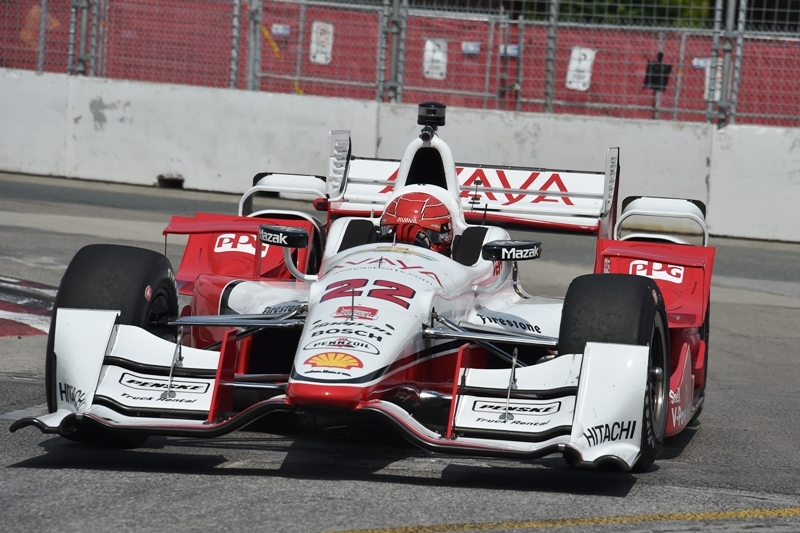 The start time of the Honda Indy Toronto was moved up in order to have the race be run between predicted rain cells, and Race Control called for a single-file start. What was your reaction to this call given that you were able to qualify P2 next to your pole sitting team-mate Will Power? Throughout the first half of the race, especially when the track became dryer, there was speculation with the on-air broadcast team (primarily Paul Tracy) that you seemed to have a set up that was better in the dry - they observed that you were challenging Will Power with a stronger car. Further, they mentioned that this race in Toronto, Penske Racing took some of the first year team orientation restrictions off to allow you greater freedom in the set-up with engineers. What type of new things - I believe Tracy used the term, ARTIFACTS - were you able to bring forward to effect in the car's set up and how did this workout in the communications with the pits? In an effort to promote more overtaking at Verizon IndyCar Series road- and street-course races, Race Control announced just after qualifications and before the race that it will no longer display entrants' push-to-pass counts and usage via indicators in its timing and scoring software. Was there any post race discussion between the folks - drivers and pit crew - about if this helped or hurt racing on the track? 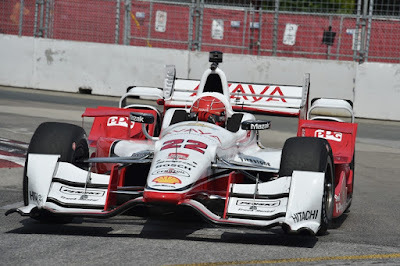 Last question on Toronto, Following a FULL COURSE Yellow on Lap 40, on the Lap 46 GREEN Flag re-start, you almost got by Will Power, then your car seemed to not have as much for the rest of the race - what happened? Simon, they have a saying in American Rules Football that it is a game of inches ... at the INDY 500 this year, you were in the thick of the competition all race until near the end when your front wing got clipped by just an inch or two. If this did not happen, did you have a car to be at the front? ... and how would you have been able to be at the line of bricks, first, against team-mates Will Power and eventual winner Juan Pablo Montoya in the end? What was your plan? The Auto Club Speedway holds two world records for speed - one for qualifications and the other for laps at race speed in traffic. In fact, one of those records is held by a former team-mate you raced with during the final season of his career, Gil de Ferran. With friends and colleagues like this in the paddock, how do you feel about the track and qualifying at Auto Club Speedway on Friday, June 26th? 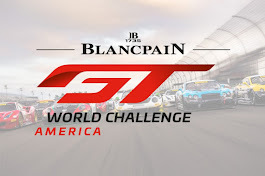 The race is scheduled to be run in the afternoon with cable NBC Sports Network broadcast window starting at 1:00pm ... and the race scheduled to start at 1:30pm and run to 4:45pm Pacific Time. What challenges are posed to you, racing three-years in a late-afternoon to evening window for a season finale, to now, competing in a 500 mile, 200 lap race all in the afternoon with five more races to go ... most of on them ovals? So Simon, do you have any special plans for the weekend off from racing? For additional information on Auto Club Speedway's MAVTv 500 and fan activities that include a driver autograph session, Driver’s Story Time with Gabby Chaves, Tony Kanaan Walk of Fame Ceremony, Southern California Wine Festival presented by Yancey’s Fancy Artisan Cheese, and Lefty’s 5k Run ... go online at Auto Club Speedway today. Also, drop in on their social media Twitter portal @ACSUpdates. We are talking with Dave Allen, who serves as President of Auto Club Speedway in advance of Race 11 Of 16 For The 2015 Verizon IndyCar Series Championship - The MAVTv 500. He was named president of the Speedway in December, 2014. Allen has served as Vice President of Sales and Marketing for the Speedway since 2006. 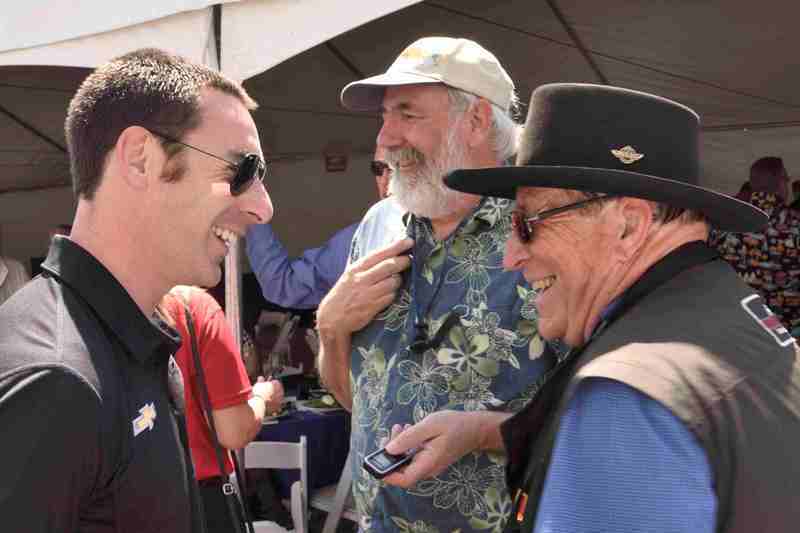 With the support of Penske Motorsports he joined then California Speedway as a marketing manager in April 1999 after spending one year at Mazda Raceway Laguna Seca. Allen has been the driving force behind the corporate sales department for the last ten years including the ground breaking naming rights partnership with Auto Club of Southern California. This partnership emphasizes the importance of strong working relationships Allen has based his career upon. From his early childhood karting days at Laguna Seca to Crew Chief of a World of Outlaws Sprint car team to his rise as the Vice President of Auto Club Speedway, Dave Allen has grown up in the motorsports world and is a race fan at heart. Coming from a racing family, Allen has seen the sport grow from both the competition side and the business side and has applied his knowledge and know-how to move up motorsports’ executive ladder. He is a 1997 Graduate of Colorado State University with a BS in Speech Communication. First off, you have been President of Auto Club Speedway since the beginning of the year, you have held several local events and hosted the Auto Club 400 with NASCAR on March 22, has the experience of being able to steer the show measured up to the expectation you felt going in after being at ACS since near its beginning? Have there been any interesting unanticipated happenings that you can share? This is the fourth year of hosting the Verizon IndyCar Series MAVTv 500. 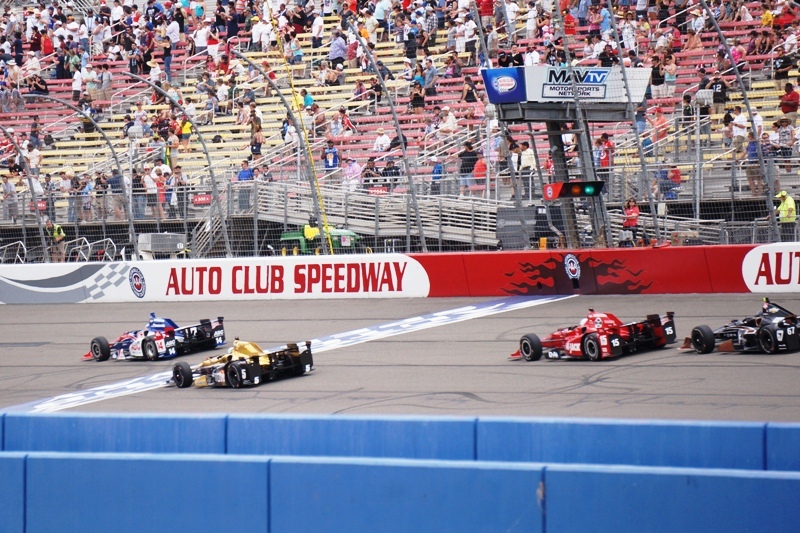 The previous three years had the MAVTv 500 as the last race of the season where the Verizon IndyCar Series Championship was finally decided on the track. How does the change of hosting a race in the middle of a series schedule effect the hosting of a race as big as a Verizon IndyCar Series open-wheel championship? There is one more race to be run at Toronto before the IndyCars come to the big oval in Fontana, making this the third oval race of the season after the INDY 500, and Texas Motor Speedway. With the new aerodynamics body kits being applied to the cars, the fly overs on crashes at INDY, and the apparent stability and record speeds shown at Texas Motor Speedway, what are you being told and what do you expect about the racing at Auto Club Speedway? The MAVTv 500 schedule begins on Friday June 26 where the infield will open at 9:00 am - Practice sessions are held during two sessions - one between 9:00 to 10;00am and the second from 12:30 to 1:30pm - followed by qualifications to be run from 4:15 to 5:30pm. What else will be happening at the Auto Club Speedway on Friday ... and what's planned that is new this year? Then on raceday, Saturday June 27, there is scheduled an autograph session at 10:00am, Driver's Story Time with Gabby Chevas and Tony Kanaan being inducted into the Auto Club Speedway's Walk Of Fame saved for winners of the previous year's race - both at 11:00am. Tell us more about what is planned as fan activity for raceday, Saturday. The race is scheduled to be run in the afternoon with the NBCSN broadcast window starting at 1:00pm ... and the race scheduled to start at 1:30pm and run to 4:45pm. What additional challenges are posed moving from a three-year run of a race in the evening and hosting a 500 mile, 200 lap race in the afternoon? Thank you, Dave, for your time, we look forward to the second race to be run on a superspeedway this season from the Verizon IndyCar Series open-wheel cars at Fontana during the last weekend in June - any final thoughts?